Justice Ruth Bader Ginsburg Undergoes Surgery For Lung Cancer Short of complications in recovery, doctors say prospects look good for a full recovery for Ginsburg, 85. She hopes to be back on the court for the start of the new term in early January. This is Justice Ruth Bader Ginsburg's third bout with cancer. In 1999, she was treated for colorectal cancer; in 2009, it was pancreatic cancer. On Friday afternoon, shortly after her surgery, she cast a decisive vote, refusing to allow the Trump administration to implement its new rules prohibiting people from seeking asylum if they cross the border illegally. The 5-to-4 decision was a setback for the administration, preventing the president from carrying out the policy immediately. By Friday night, Ginsburg was sitting up in a chair, and calling friends, who said she sounded strong, and pretty chipper. "According to the thoracic surgeon Valerie Rusch, both nodules removed during surgery were found to be malignant on initial pathology evaluation. Post-surgery, there was no evidence of any remaining disease. Scans performed before surgery indicated no evidence of disease elsewhere in the body. Currently, no further treatment is planned. Justice Ginsburg is resting comfortably and is expected to remain in the hospital for a few days." Mathisen said, "These days we are seeing more and more patients in their 70s and 80s make relatively quick recoveries, because we are detecting so many more lung cancers at early stages" when treatment is far more effective and successful. Removal of a lobe is considered "the gold standard" in treatment, and while it means a loss of 15 to 20 percent of the lung, it "can recover," he said, with the other four lobes taking over some of the lost function. 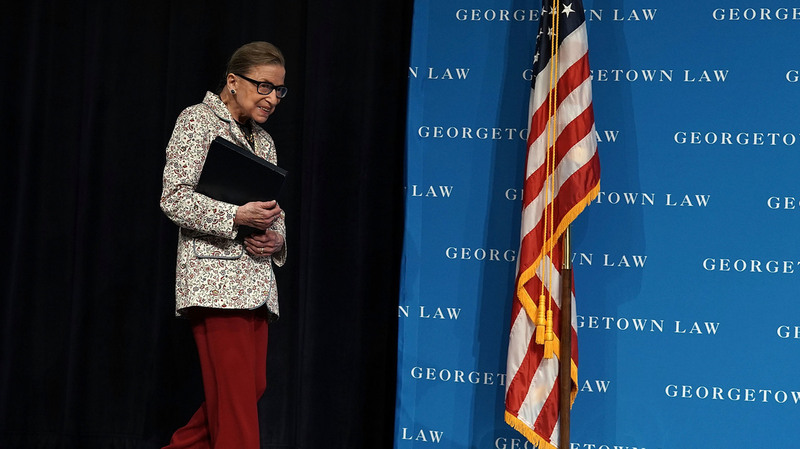 Mathisen and other thoracic surgeons said Justice Ginsburg's prognosis ultimately will depend on the pathology findings, which will not be available until days after the surgery. If there is no lymph node involvement, surgeons contacted by NPR said the prognosis for being cancer-free at five years out is 80 percent. This is Justice Ginsburg's third bout with cancer. In 1999, she was treated for colorectal cancer; in 2009, it was pancreatic cancer and, now, lung cancer. During her 25 years on the court, though, she has never missed a day of oral argument. The next argument day is Jan. 7, and Mathisen said it is possible that she will be able to keep her record intact, but he warned that overdoing things can ultimately slow a patient down, meaning "one step forward and five steps back." News of Ginsburg's latest bout with cancer is yet another blow to the Supreme Court's liberals, now outnumbered 5-4 on the nation's highest court. Ginsburg has become something of a feminist cultural icon and defies the image of the angry feminist. She is both decorous and determined and makes it a point not to "waste energy" on emotional reactions. She has become the leading liberal voice on the Supreme Court, and even if she recovers fully from this latest bout with cancer, she likely will be "playing hurt" for a while. That is something she has done for years, powering through even the death of her beloved husband of 56 years in 2010. But she is 85, and there is no way of sugarcoating that fact — even though her mind remains sharp as a tack. Should Ginsburg's health falter further, President Trump could see a third opportunity to fill a seat on the Supreme Court. In early 2017, the GOP-controlled Senate changed the rules to allow a simple majority to confirm a Supreme Court justice, which paved the way for Trump's first pick to the court, conservative Neil Gorsuch. A year prior, Senate Majority Leader Mitch McConnell took the unprecedented step of blocking President Barack Obama's nominee to the court, Merrick Garland, for nearly a year after conservative Scalia died in February 2016.